Save 80% Today Only! 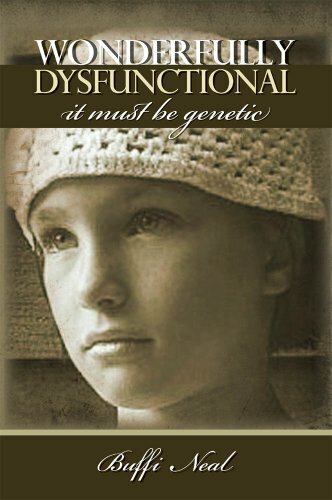 Buffi Neal’s Amazon Bestseller in Family Memoirs Wonderfully Dysfunctional: It Must be Genetic *Plus* Don’t Miss Today’s Kindle Daily Deals! ON SALE! NOW JUST $1.99! The true story of… A gypsy mother who refused to wear a bra and a father who refused to leave his first wife. A brother who slept under the coffee table and a sister who was kidnapped. A cheating minister, a missing uncle and a feisty red-headed grandmother who was longing to leave it all. I always knew my family was unusual, but I was lucky enough to have escaped that gene. Or was I? In a nursing home, seated next to my dying grandmother, I looked around at my family and it occurred to me that I fit right in. No bra, dirty sneakers and two ex husbands. Maybe it really is genetic – maybe I never had a chance. With the help of my siblings, I began a journey of self discovery as we recalled stories of our youth including juicy family secrets, inappropriate practical jokes and betrayal.